Michael O'Shea is a professional thief, descended from a long line of professional thieves. 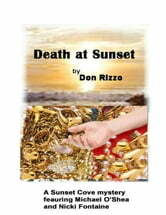 A seemingly simple, well-prepared heist in the jewelry district goes slightly awry, and propels him into a heist for hire in Sunset Cove, Florida. He is enlisted to restore a painting stolen by his new employer's daughter and her drug dealing boyfriend, who are not aware it hides something of very high value. But a killer is also burglarizing homes and condominiums in Florida, and has targeted the condominium occupied by the daughter of Michael's new employer. The killer strikes almost on the heels of Michael's burglary, and kills the daughter of Michael's employer, leaving Michael as the logical suspect in her death. Michael must find and expose real killer before he is caught, and perhaps killed, by the police, his employer, or the mob-connected father of another of the killer's victims. And before long, the killer is stalking him as well. But a chance meeting with Nicki Fontaine may offer his only hope of survival.